Back in 2007, three Dutch friends decided to start walking a new and more serious path. With the addition of a bass player and a second vocalist they were ready to work on their first effort as the band Formula Fiction. 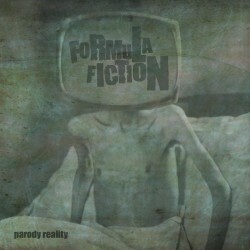 This first release, a more than 15 minute long EP called Parody Reality, is definitely more serious than many releases of similar bands. That this band isn’t just here for the beer is proved by the lyrics. The lyrics for example about humans being a black page in the history of the earth, changes that could only be realized when people are willing to change themselves and the fight against the nobility are pretty straight to your face. Musically the band combines aspects of different genres with each other. The basis of the band mainly exists of death metal influences, but they’re not afraid to mix this with for example breakdowns or pig squeals (a.k.a. Bree Bree Breeeee). Furthermore they use multiple changes in pace to keep things interesting and the aggression and energy they’ve put into the songs during recording can be felt as well. Besides all these positive aspects there are also some negative ones though. There’s nothing wrong with the foundation of the band, but while working they weren’t accurate all the time. Not everything is as smooth as it should be, but taking in consideration that the band has done every little thing itself that isn’t a big point of criticism. The last question mark is about the benefit of two vocalists. On Parody Reality they can’t really distinguish themselves, but maybe this will be one of the aspects in the future that will distinct them from other bands trying to reach the same goals.